The Leonides are one big happy family living in a sprawling, ramshackle mansion. That is until the head of the household, Aristide, is murdered with a fatal barbiturate injection. Suspicion naturally falls on the old man’s young widow, fifty years his junior. But the murderer has reckoned without the tenacity of Charles Hayward, fiance of the late millionaire’s granddaughter. Like most of my favorite Agatha Christie mysteries, this is one of the standalones, without either Poirot or Miss Marple to come in and discover the culprit. 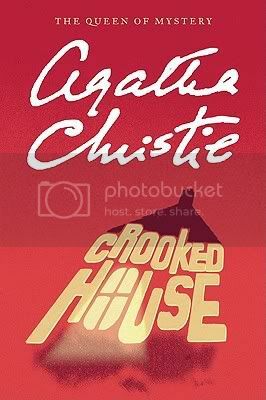 Crooked House is told from the perspective of Charles Hayward, whose father works for Scotland Yard, and who is determined to solve the mystery of Aristide’s death, because his fiance, Sophie Leonides, will not marry him until she is assured that her name, and that of her family, is cleared. I actually thought this was a very enjoyable mystery from Christie, but the problem is that I solved it within a sentence of being introduced to the killer. Literally. That is not exaggeration. I don’t think this is actually a fault of the book, but of the fact that this was my 3rd Christie in as many weeks, and probably my 5th (at least) over 2 months. As much as I enjoy her, it is time for a break. It just isn’t the same when I don’t spend the entire book trying to match wits with her. I cracked up at this — my wife is a guess-the-murderer reader — by accident — and she had this experience after a glut of Christies one summer. Yup – it’s a real treat to match wits with Christie, but I guess she had to have a basic formula or she couldn’t have written all of those books. It’s a shame that we have to take holidays from her, but it’s so true…. Too funny! This was one of my first Christies, so I was absolutely floored by the resolution, but on subsequent rereads it has been rather obvious. I still do love it, though, because I find many of the characters fascinating, and I think she created quite a cast here. As soon as I have an open reading moment, though, I do want to try your Julie Hyzy recommendation. Is she less predictable (for lack of a more nuanced word) than Christie? I think she is, I read 3 of her books in 2 months and don’t believe that I guessed the endings to any of them. Of course, it is always easier to SEEM less predictable when you don’t have such a huge oeuvre in which people can spot your patterns. WOW-I have only ever solved one of her mysteries (Five Little Pigs). I can’t imagine solving it that fast no matter how many I read. I also do tend to like the standalones more than the Poirots but I have a soft spot for Miss Marple. This is one that I haven’t read before, but I know it’s a favorite of many of my friends. Can’t wait to read this one. And sometimes taking a break from a certain author is good for you.